It can be very rewarding to step back from a project you have been involved with for many years and see how it has evolved and changed over time. 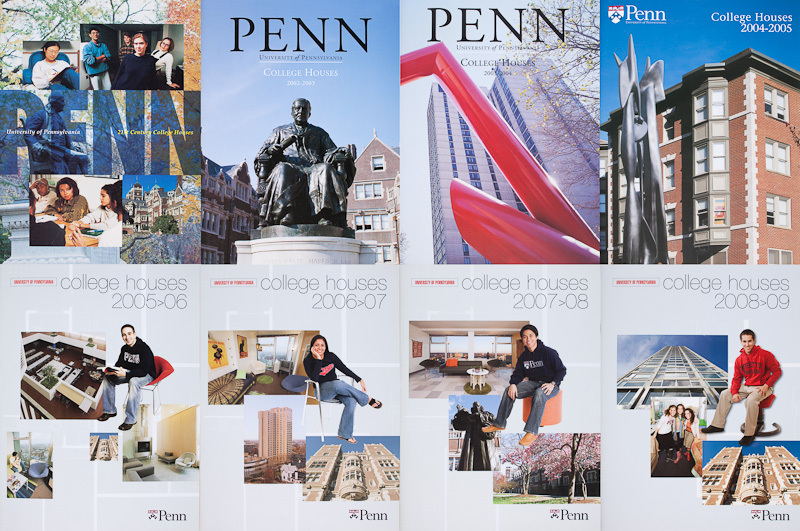 Greg has been photographing for University of Pennsylvania's catalog of College Houses for thirteen years. The designs and concepts have changed over that time. It is fun to see some of the covers together and trace the evolution. More than just the designs have changed over the years. The cover concept for the catalogs from 2002 through 2005 called for a photograph of one the many sculptures on campus in the foreground and Penn dormitories in the background. The photograph had to wrap around to the back of the book and digital capture technology of the day was not up to the task. These series of covers were all shot in large format film. The redesigned cover for the catalog for the 2005-2006 academic year set a new concept that was continued on until last year's catalog. Though Greg had already been shooting digitally for some assignments before this, it is during these years that the studio saw less and less of a necessity for shooting film. The day that marked the final transition to fully digital for all assignments was somewhere in the middle of 2007, and by the end of 2008 Greg's large format and medium format cameras had found homes outside of the studio. Not just University of Pennsylvania, but all of our clients' needs continue to change and evolve. Our tools (not longer just cameras, lenses, and lights; but now also computers, software, and hard-drives) continue to change and evolve at an accelerating pace. After about one hundred years of slow to little change, right now is a very exciting time to be a photographer and embrace all the new possibilities. But, it requires that one is willing to continue to be a student. In March we posted about being able to get a shot thanks to the tripod's flexible range. Last week the tripod made a difficult shot possible by providing much needed extra height. 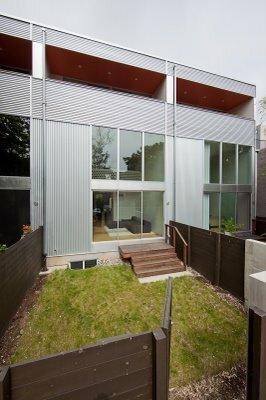 To photograph the rear facade of the above group of townhouses in Northern Liberties, Greg wanted to get the camera at a high enough angle to see past the fence and into the first story of the homes. Above we can see that the tripod nearly completely extended, and that Greg needed to perch himsef on a ladder to operate the camera. Next we got closer to the fence to get a shot overlooking the home's backyard. Greg found himself needing a bit of extra height. Shooting on location requires being flexible and ready for the unexpected. 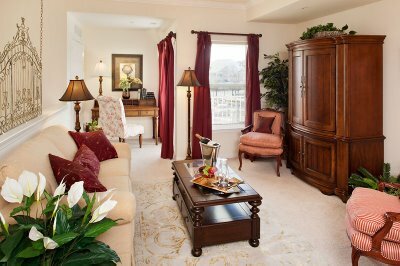 The above interior photograph was shot earlier this week at an apartment home community in Cherry Hill, NJ. And to make it possible this time it was our trusty Gitzo tripod's turn to be more flexible than normal. To capture the living room in this model unit a high angle from somewhere behind the kitchen countertop was required. Greg started with the tripod butted up to the kitchen counter and eventually found the optimal shooting position was directly on said countertop. See the extreme tripod position below. This week I had an assignment to photograph the Mayor of Philadelphia, Michael Nutter. I was hired by the Institute of Law and Economics at the Penn Law School to document the Mayor speaking at their Law and Entrepreneurship Lecture series on the importance of education to the city. Nutter is smart and articulate, and not afraid to speak his mind. Having residents of Philadelphia succeed with their public schooling and increasing the percentage of college graduates in the city are goals of his administration. Children who graduate from high school are less likely to end up in jail and a city with an educated work force attracts businesses that pay good salaries. These are sensible and worthy goals. Achieving them won't be easy. Yesterday afternoon it was reported on cnet.net (and also discussed on The Online Photographer Blog) that Olympus is happy at a 12 Megapixel file size and will not be pushing development of larger sensors for their E-System cameras. Instead Olympus will concentrate in improving their sensors in other very important ways: "dynamic range, color reproduction, and a better ISO range for low-light shooting." The camera-buying market has this unquenchable thirst for higher, and higher megapixel count when that is not necessarily as important as the other characteristics of a digital capture. Camera manufacturers know this, but I think to a large extent feel they have to perpetuate this "Megapixel Race" to satiate the market demands and not to be perceived inferior to their competitors. We have recently upgraded to Canon 5DMKII cameras that make 21.1 Megapixel files (almost twice the size of the files from our previous cameras); and, while the added file size is definitely an advantage if an image needs to be cropped severely, the real improvements over the previous generation 5D are not the increased file size. The 5DMKII also has much better color range than the previous cameras, simply put: there are more possible colors the camera can reproduce, and that means more color subtlety. The previous generation also improved on this, making waxy-looking flesh-tones a memory of digital captures past. Increasing dynamic range (the range of values in brightness from darkest to brightest that a given digital sensor or piece of film can record) is to me where development needs to be. Aside from some forgotten and somewhat unloved cameras from Fuji (the S1Pro, S2Pro, and S5PRo), most manufacturers have avoided promising increased dynamic range. In this area most of the headway is currently made with digital post-production -- multiple exposures, CameraRaw manipulation, etc. The trend to push HRD (High Dynamic Range) techniques is proof of that many are fascinated by the prospect. Larger file sizes also bring new problems to the working photographer. Where last year the studio generated almost 1.5TB worth of images and files, we can expect to double that or more in 2009 with the new cameras. More files mean a lot more storage needs to be devoted not just for archiving the image but also to keeping everything backed up. Larger file sizes immediately render one-year-old editing stations painfully slow. Larger file sizes make some previously good lenses seem less sharp -- yes, a large enough sensor can reveal imperfections in lenses that seemed optically perfect with film and smaller sensors. Still, the megapixel count WILL go up. We should all consider which other features are more important instead, maybe manufacturers will devote more resources to developing in those areas instead of just increasing the file size.